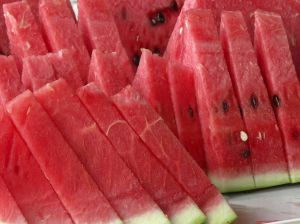 Watermelon Makes the World Go Round! As part of our efforts, CORVA donates money to various causes. The money is earned by selling cups of watermelon at ComFest, Columbus's community arts festival and through the sale of calendars created by the Returned Peace Corps Volunteers in Madison, Wisconsin. “If it’s raining, it’s ComFest!, I overheard someone in passing while assessing the mess that was the CORVA Watermelon booth this year. This year, not only did having the entire event shut down all day Friday cut into profits, but gallons of rainwater accumulated in pools on the 10x10 ft. EZUp we’d set up Thursday night. The whole thing collapsed and broke under the pressure of the water at 9am Friday. While I “mopped up”, untangled and sorted things out, Jim bought another enclosure at Costco, only to text me that Friday’s Fest was canceled! So I stuffed two booth’s worth of stuff under the chocolate dipped frozen banana 10x10 enclosure and made it home by 3:30pm. What a day! Saturday and Sunday’s weather redeemed itself gloriously with dry, sunny, high 70’s and low 80’s temps. Both watermelon and banana sales flourished in our new location at the intersection of Russell and Park Street (where Jeni’s Ice Cream has been in previous years.) It seems like a great spot and I’m hopeful for an even more profitable 2018, good Lord willing and the creek don’t rise! $1,641.36 is the 2017 profit for which I wrote a check to CORVA. We cut 112 melons and donated 13 left Sunday pm to the Faith Mission. This was CORVA’s 15th year Sellin’ Melon at the ComFest. Funds raised this year bring the 15 year total to $37,246.25. Dave Patrick, Ray Domire, Jack Kangas, Ben Bloom, Denise Hilliard, Ann Nelson, Ann Buhr, Jessica Adair, Gail Messick, Michael Goldman, Val Fronzak, David Regen, Alyssa Bryant, Peter Ross, Phillip Martin, Kristi Urig, Shirley and Pete Wilms, An OSU student and her mom!, Laura and Kevin Flaute and Bill Gordon. Until next year - PEACE, LOVE AND WATERMELON! CORVA members also sell them, or you can support us by buying one at Global Gallery, 682 N High St., Columbus, Ohio. Global Gallery buys them from us and sells them to you. We must admit, these calendars are fantastic and make great gifts. Remember your child's teacher, even if your child is a high schooler. They are a wonderful classroom resource. 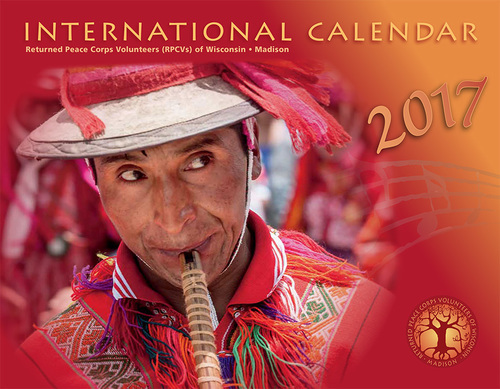 Information about the calendar from the Returned Peace Corps Volunteers of Wisconsin, Madison, website: "The International Calendar is more than just another annual time marker with pretty pictures. It is also designed as a teaching aid, introducing varied life styles, terrain, foods, occupations, and crafts from around the world. Each year we provide Calendars to teachers who participate in Peace Corps' Paul D. Coverdell World Wise Schools program." How we decide who gets money? CORVA members suggest who CORVA should donate money to based on their own knowledge and experience about an organization. We tend to give money to smaller charities that are not as well known, thus have a more difficult time with fundraising. We also give, in general, where Peace Corps volunteers serve. Our donations tend to be between $200 to $300. As people who once lived in developing countries, we know how far such a small amount can go.